Hello again Quepolandia readers. Happy 20th birthday to this amazing magazine, which is twice as old as me! Thanks for reading! This is Karma Casey, the spokes-kid from Kids Saving the Rainforest. For those of you who don’t know who we are, KSTR is a wildlife rescue and sanctuary outside of Quepos, Costa Rica. We help two-toed and three-toed sloths, monkeys, coatimundis, kinkajous, porcupines, parrots, and more! We also plant trees, put up wildlife bridges, educate the public, and do lots of other things to help save the rainforest. If you find sick, injured, or orphaned wildlife, contact our veterinary staff via What’sApp at 88-ANIMAL (506-8826-4625) and we can help! This month’s article is about probably one of your favorite animals: A sloth! 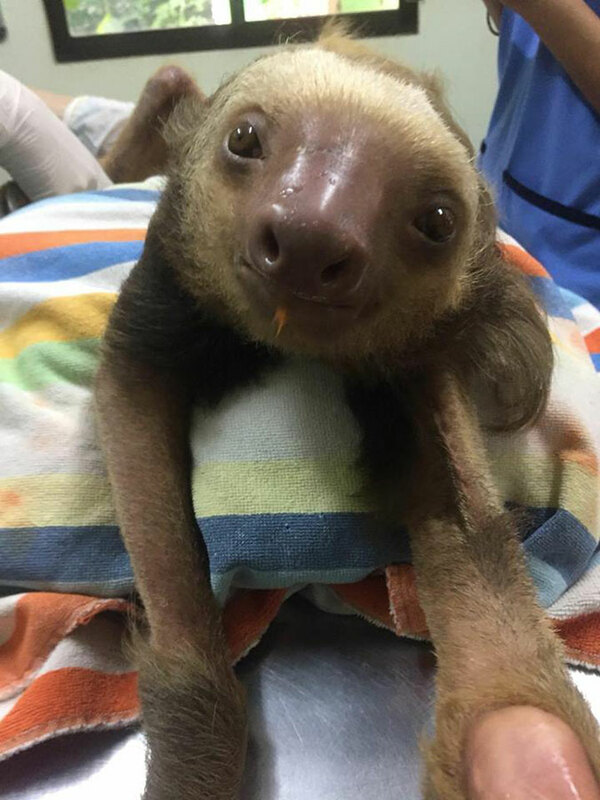 I have interviewed some of the lucky, hard-working members of our veterinary clinic team to tell you all about one super special and amazing two-toed sloth named Senor Dona. 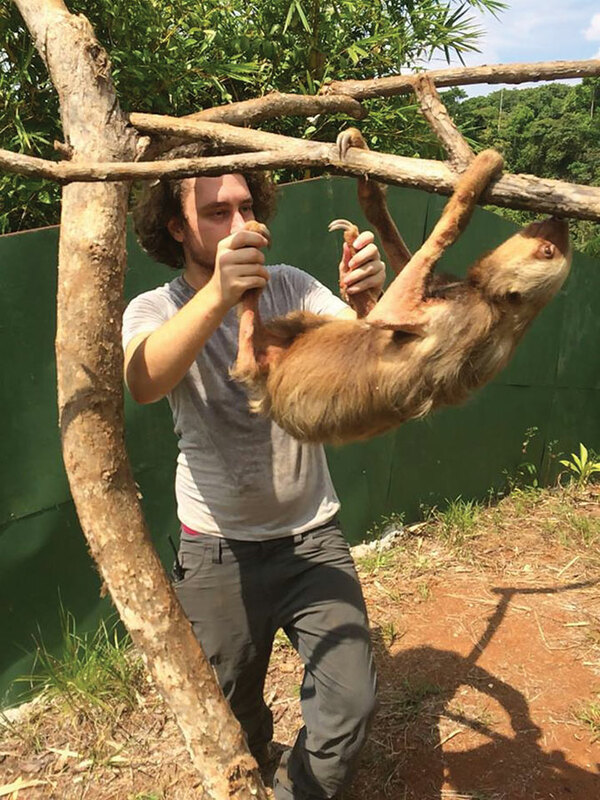 Dona is an adult male two- toed sloth who was found over an hour away towards Jaco. Kids Saving the Rainforest was alerted by our friends at MINAE and SINAC (two government agencies that work hard to protect Costa Rica’s environment and wildlife) that a sloth had been hit by a car. The wildlife professionals at KSTR quickly came to the rescue, and Senor Dona was rushed to our veterinary clinic. Upon examination, developing burns were discovered on Dona’s body that were evidence of electrocution. Senor Dona was sadly electrocuted, fell, and then got hit by a car. That’s a lot for a sloth! Due to his injuries, he cannot move the lower half of his body. 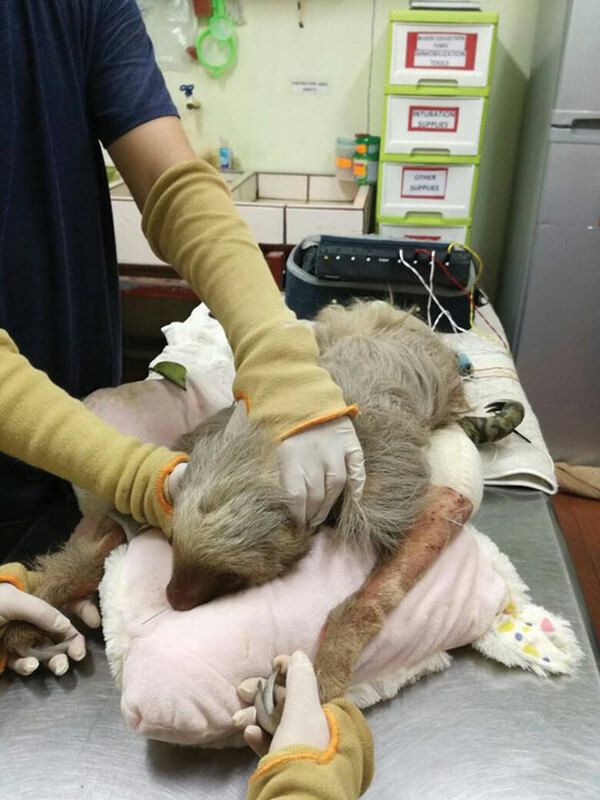 Kids Saving the Rainforest is doing everything we can to help Senor Dona regain the use of his legs and get well again, including giving special daily sloth massages, and trying non-traditional forms of healing to help him on his way! Joining our efforts is Dr. Tania Zeledon, a veterinarian from San Jose. Dr. Zeledon specializes in alternative healing therapies for animals. She travels to Quepos once a week to give acupuncture to people’s pets, and she is donating part of her time to helping Senor Dona! Dr. Zeledon performs acupuncture on Dona, inserting needles into his skin at special acupuncture points to stimulate healing. Don’t worry, the needles are tiny and she is helping him to get better! She also performs Ozone therapy and therapeutic massage. The clinic team has learned lots of new and different ways of looking at healing animals from Dr. Zeledon, which Kids Saving the Rainforest can use to help Senor Dona and other animals who come to us needing help! Senor Dona has been progressing slowly with everyone’s help. He still cannot properly use his back legs, but he has been able to hang some and with time we hope he will keep getting better and better. 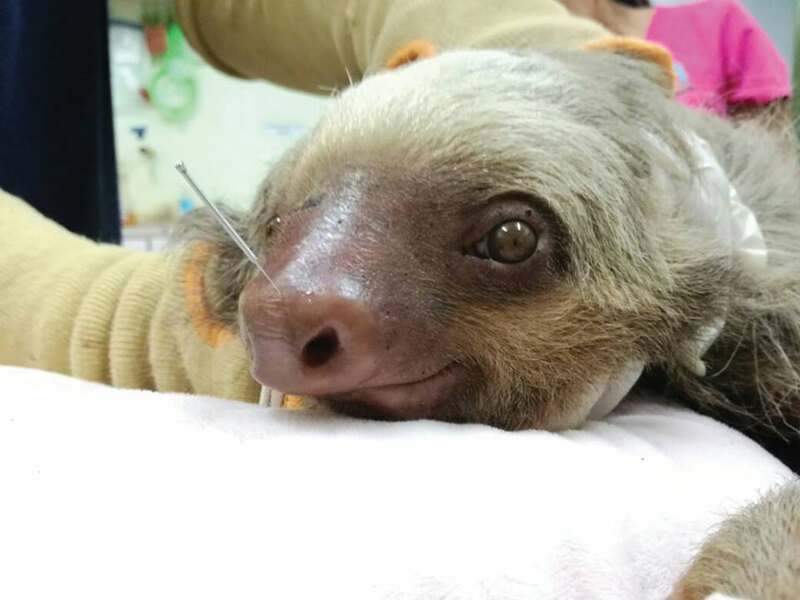 He is a brave and courageous two-toed sloth who has been through a lot! t forget! Slow down and watch out for wildlife as you are driving around Costa Rica! We share this beautiful country with many amazing creatures big and small, and they depend on us to treat with them with the respect they all deserve! A special thanks to Dr. Tania Zeledon. If you’d like to speak to her about acupuncture for your pets, you can reach her at (506)8854-8984. If you’d like to write to Karma, she can be reached at spokeskid@kstr.org.